Peterson Wealth Advisors is founded on the goal of assisting you in a variety of aspects of your financial life. We make every effort to provide high quality, personalized, and responsible service, striving to help you achieve financial stability in an effort to provide financial independence for each of you. Our staff of caring and experienced professionals demonstrate a hands-on approach to your financial guidance. We hope that you will find our team knowledgeable and that we truly care about helping you work toward achieving your financial dreams. As your financial professionals, we will do everything in our power to keep you consistently focused on where you want to go, advise you of options on ways to get there, and continually remind you of the importance of maintaining a disciplined approach to realizing your dreams. As your partners, we have a single vision and that is to help you plan to achieve your financial goals today and in retirement, sharing responsibility for your success. You and your success are the focus of our commitment to you. We help you to invest knowledgeably with a sincere desire to guide you through your financial lives, motivating you to take advantage of opportunity, and to help you protect your wealth in an ever-changing economic environment. 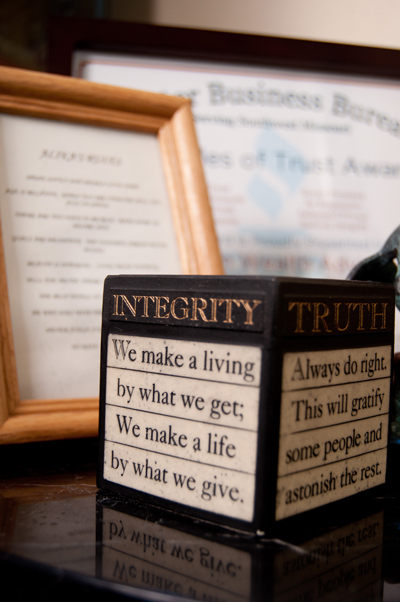 We work closely with you from the start to create a long-term relationship built on integrity, honesty, and trust. We tailor a financial plan to you, striving to incorporate your goals with our strategies. A consistent review of this plan, along with a mutual commitment to a successful relationship, facilitates the ongoing evolution of the plan to completion. It is critical that we meet regularly to review your portfolio, assess any changes in your circumstances, and keep you abreast of any issues that may affect your financial future. As part of our client family, you can expect to receive an invitation to meet at least four times the first year and, after that, we will agree upon a frequency that is comfortable for you. You can expect that any call made to our office before 3:00 P.M. may be returned by your advisor or someone on the team, on the same day. Calls made after 3:00 P.M. may be returned on the next business day. While we endeavor to execute all business without error, we promise that any problems will be promptly addressed. Our company is based on the principle that education and understanding of your current financial situation are vital to successfully helping you make prudent decisions concerning your future financial condition. If you have any questions about your current financial situation or wish to schedule an appointment, send us an e-mail or give us a call at (417) 887-4950. Our commitment: To strive to provide you with comprehensive financial service supported by the team and the systems to deliver on that promise. Your first home, retirement, future generations . . . Bringing it all together for you with confidence, planning, patience, and integrity.